I'm using using Windows Vista and I'm having trouble logging in with a newly created user. I open SQL Server Management Studio. I create a new Login by right-clicking on Security->Logins. I added this user to User Mapping to my database of choice. Click File -> Connect Object Explorer, select SQL Server Authentication and enter tester/test and click Connect. Login failed for user 'tester'. (Microsoft SQL Server, Error: 18456"
with Severity = 14 and State = 1. What causes this error and how do I login with my user? SQL Server was not configured to allow mixed authentication. Select Security from the left pane. Select the SQL Server and Windows Authentication mode radio button, and click OK.
Right-click on the SQL Server instance, select Restart (alternatively, open up Services and restart the SQL Server service). This is also incredibly helpful for IBM Connections users, my wizards were not able to connect until I fxed this setting. If you haven't restarted your SQL database Server after you make login changes, then make sure you do that. Start->Programs->Microsoft SQL Server -> Configuration tools -> SQL Server configuration manager -> Restart Server. It looks like you only added the user to the server. You need to add them to the database too. Either open the database/Security/User/Add New User or open the server/Security/Logins/Properties/User Mapping. You'll likely need to check the SQL Server error logs to determine the actual state (it's not reported to the client for security reasons.) See here for details. 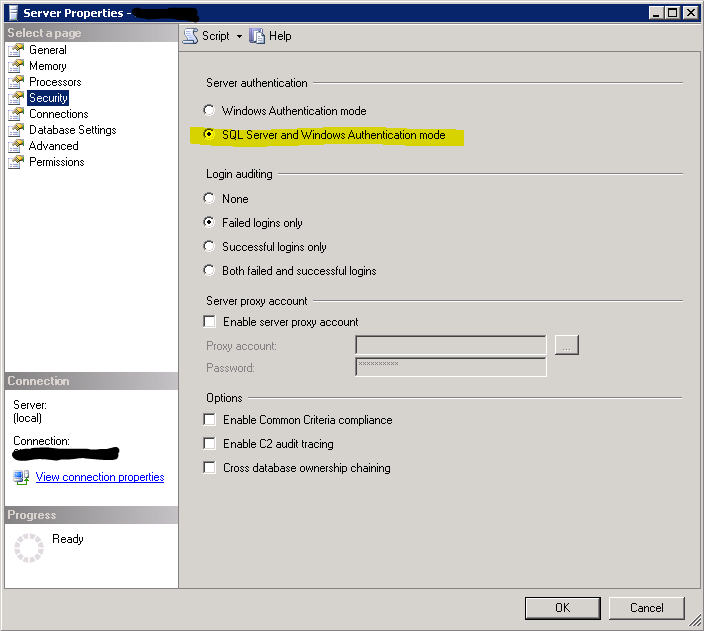 Select  SQL Server / Windows Authentication. More Info on, what is the differences between sql server authentication and windows authentication..? Not the answer you're looking for? Browse other questions tagged sql-server authentication login ssms or ask your own question. what is the differences between sql server authentication and windows authentication..?